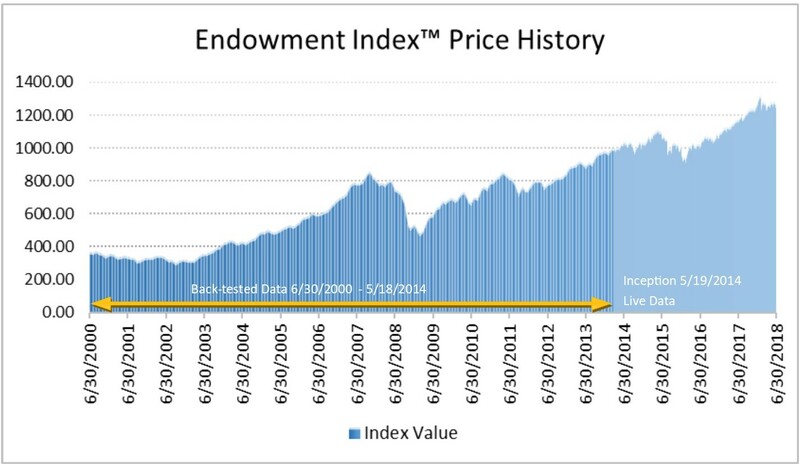 To request an Endowment IndexTM Quarterly Fact Sheet, or obtain a download of historical daily index data, please scroll to the bottom of this page and complete the request form. The Endowment IndexTM represents the investable opportunity for managers of portfolios utilizing the Endowment Investment PhilosophyTM or otherwise incorporate alternative investments within a comprehensive asset allocation. The index provides an objective tool used for portfolio comparison, investment analysis, and research and benchmarking by fiduciaries, trustees, portfolio managers, consultants and advisers to endowments, foundations, trusts, defined benefit/defined contribution plans, pension plans and individual investors. Period from 7/1/2000 through 6/30/2018. Past performance not necessarily indicative of future results. Current performance may be lower or higher than past performance. To receive the current fact sheet and Index data history please provide a valid email address, then click “CONTINUE“. Please do not fill out your First Name/Last Name/Company Name until your email has been verified (don’t worry- it only takes a few seconds). By submitting your name and contact information, you agree to opt in to receive future email updates on the Endowment Index™. After we have verified your email address, please continue your request by filling out your First Name, Last Name, Company Name, and the Alpha-Numeric code (to prove your not a robot), then hit “SUBMIT”. If you don’t receive an email containing information on the index within a few minutes, please check your spam or junk-mail folder. If your requested information is not in your spam/junk folder- don’t give up! Just send an email request to info@etfmodelsolutions.com, or call us at 920.785.6012 and we will gladly get this information out to you. ETF Model SolutionsTM values your privacy and we will not sell or share your contact information. *Refers to underlying components. Reported index results do not have fees and expenses. You typically cannot invest directly into an index. Award recognition does not qualify as an endorsement of any particular index, investment or investment strategy. ETF Model SolutionsTM does not make solicitation payments to award sponsors in order to be nominated or to qualify for the nomination of an award. For information on the Index of the Year award, visit ETF.com.